Most people will, unfortunately, experience the death of a refrigerator and/or freezer. Like all appliances, they have a shelf life, and you’ll be shopping for a new one at some point in your life. This is a major investment, and you don’t want to go into this process unprepared. Choosing the right refrigerator won’t make or break a kitchen, but it will determine your comfort level. You want a functional piece that won’t break down, ruining everything you have inside. When it comes time to replace your refrigerator, use this simple buying guide. Since a new refrigerator is such an expensive investment, be sure it’s the right way to spend your money at this time. In some cases, a broken refrigerator can be revived and will serve you well for several more years. If it’s still under warranty, the repair or replacement of your fridge could be free. Research refrigerator repair FAQs and guides to provide insight on whether or not the refrigerator can be fixed. You can also have a repair person inspect it for a small fee. Once they’ve quoted you a price to fix it, you can decide if it’s more feasible to make repairs or simply purchase a new one. 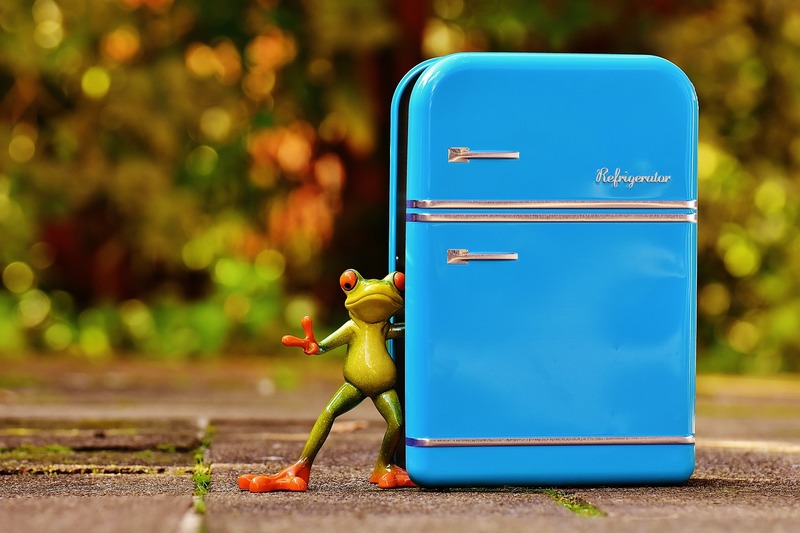 Another great budget option is to look at gently used refrigerators. When people move or apartment complexes are torn down, they often sell their appliances at great prices. Some appliances in this lot are extremely worn down and not worth your time, but others have only been used a year, and the cost is considerably cheaper than a brand new one. If you’re on a budget, this is a great option. Top Freezer: The most traditional refrigerator with two-thirds of the unit on the bottom as a refrigerator and a third on the top as a freezer. Bottom Freezer: The flipped version of the top freezer with the larger refrigerator portion on top and the smaller freezer portion on the bottom. Side-by-Side: Two doors run the length of the refrigerator side by side. One side is the refrigerator and the other is the freezer with a water and ice dispenser on the front. French Door: One of the most popular contemporary options for refrigerators, these large units have French doors that open outward to reveal the refrigerator on top and the freezer as a drawer on the bottom. These units are larger than traditional refrigerators and feature a water and ice dispenser on one door. This list is ordered from least to most expensive with the top freezer costing the least and the French door typically costing the most. The stylish French door refrigerator is the most popular of the appliances, but do you really need such a large unit? If you live alone or it’s just you and your partner, a massive French door refrigerator might be excessive. In that case, a simple top freezer could be perfect. However, top freezers rarely have water and ice dispensers, and if you’re the kind of person who craves filtered ice water in each glass, a side-by-side might be best. Think about how your new refrigerator will fit into your lifestyle before settling on a certain model. You’ll also want to look inside the refrigerator and think about your food habits. If you’re big on vegetables and deli meats, make sure there’s adequate crisper space with adjustable temperatures. If you always have two liters of soda or lots of juice and milk, make sure there are adjustable shelves so you can easily fit your beverages inside. After you’ve selected the right model, make sure it will fit in your home. Start by choosing the right finish. If your other appliances are white, a stainless-steel refrigerator will look out of place. It’s usually best to match your appliances unless you’re expecting to phase the others out soon. Next, make sure there’s room for your new refrigerator. Some units are significantly larger than others. If you have a designated space between affixed cabinetry, measuring the dimensions is essential. When you’ve taken the time to research refrigerator models and amenities, you won’t be disappointed when your new refrigerator is installed and ready to use.